Beautiful detached house north of Florence. These three small houses are located in the Tuscan countryside. The former farmhouse has been completely renovated. They are situated in a quiet area and are comfortably equipped. The area is at 620 metres above sea level. You will enjoy a fenced garden with a shared swimming pool. The garden boasts a beautiful view of the surrounding hillside. The beautiful hilly landscape extends in every direction. The houses are located close to Foreste Casentinesi National Park. The park is the ideal place to hike, go mountain biking, birdwatch and much more. The town of Dicomano is a 15-minute car ride away. Here you will find several shops. Florence is 45 kilometres away. The owner has a map with all numbered trails. You can hike without any worries because all paths are numbered, even in the woods. . It is possible to visit the farm, to organise kid's learning activities, to see workers milking the cows and shearing the sheep. You can join us during the chestnut harvest that is organized in October. You can boil chestnuts and make bruschiate (toasted bread) yourself. 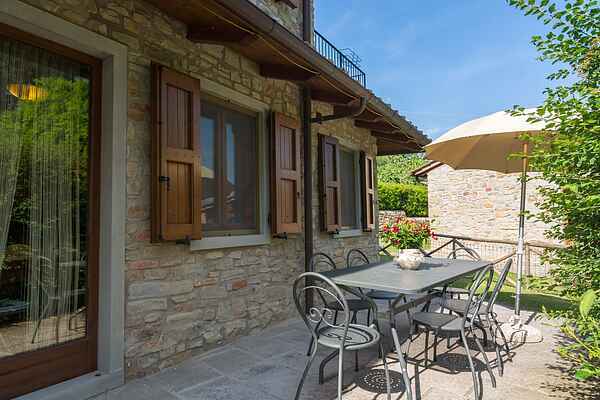 The farmstay can organize pizza parties with wood-fired oven. Corrella is a small town 4 kilometres away. It features a private club where you can taste traditional food from the Mugello region. Trails are suitable for mountain biking and Nordic walking. Guests visiting Florence can dine at the family-run restaurant "Salsamenteria dei Ciompi", located on Piazza dei Ciompi. They can enjoy a 10% discount on items in the menu.